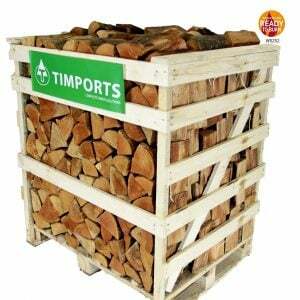 KILN DRIED FIREWOOD: Shop at Timports Ltd for all your firewood needs. As UK's leading supplier of kiln dried wood fuel we can supply premium beech, ash and oak logs in pallet crates, nets and kiln dried pine kindling. Why not try KILN DRIED LOGS instead of seasoned logs, kiln dried firewood burns hotter than seasoned, as firewood suppliers and specialists, we only supply premium kiln dried wood fuel. Our logs for sale are beech, ash and oak logs the best firewood hardwood species for your open fires, wood burning stoves, multi fuel stoves and not forgetting the summer months for wood fired pizza ovens (beech is best) and fire pits. Firewood delivered to your home or business so stock up for winter and those warm summer evenings around the barbecue or fire pit. Oak Logs For Sale - SPECIAL OFFER was £177 - NOW £162 Saving You £15.00. Only 45 OAK Half Crates Available. When They're Gone They're Gone!!! Buy Today Before They're Gone!! Our nets of beech hardwood logs are available in 20, 30, 40, 50, 70, 140 nets they are delivered on pallets and covered and wrapped to protect your logs from the elements. Don’t forget your fire kindling or our Eco firelighters. Our firewood is stacked in pallet crates that can act as a log store and comes in two sizes, our 1.2m3 crate or the huge 2m3 crate. Log length approx. 10 inch (250mm) and 10-15% moisture content. Please check out our logs delivery page and the general delivery information on access. This crate is huge. Available in all grades QbA, Qb1, Qb2, Qb3. Our kiln dried oak boards are dried to 8 - 10% moisture, available in 27mm, 32/34mm, 55mm, 100mm. We can supply any amount from single pieces to full truck loads, it is produced from sustainable cropped European woodlands and is beautifully grained and available in all grades. Rustic Qb2-3 Oak is perfect for all types of uses including flooring and furniture production. Premium Qb1 boards are the best available grade and are perfect for top quality furniture manufacture, top grade oak floors, window manufacture etc. etc..
Uniquely, not only do we supply quality kiln dried waney edge and rare wide & thick oak boards, we can also hand finish them to your specifications. We will edge, size, thickness, sand and finish - oil, stain, varnish, distress, any combination of these or untreated - any board or quantity of boards and deliver them direct to your door. Please contact us to discuss your needs. Most fireplaces, wood burning appliances are the focal point of a room, especially in those colder months, the warmth from the fire, the scent of wood smoke, the smell of dry logs stacked by the side, all characteristics of a good fire. What makes a bad fire? Wet, damp wood, high moisture content inside the logs, green logs just cut (not seasoned/kiln dried). It’s a customer’s nightmare as bad firewood can cost you more money not just on the load of logs you just bought but the damage it could cause to your chimney, flue, the build-up of creosote and soot can be dangerous. So, what we do is make it easy for our customers when buying firewood, whether you contact us, over the phone, email us your order or buy logs online we can provide you with regular firewood deliveries and friendly professional advice. Why buy kiln dried logs? It comes down to the internal moisture content of the logs, the drier the log the better the burn (heat output). The kiln drying process reduces the moisture content in the wood, making kiln dried firewood more energy efficient. Insects and mould spores do not survive the kiln drying process, powder post beetles, ants, termites and Asian long horned beetles are all destroyed. The average moisture content is less than 20%, should be easy to light and provide a clean burn. The glass on your wood burning stove shouldn’t go black and your flue shouldn’t get excess build-up of soot or tar, which could cause chimney fires. It’s not just firewood we sell, we supply prime grade oak timber, straight edge, waney edge boards. we can supply any amount from single pieces to full truck loads, it is produced from sustainable cropped European woodlands and is beautifully grained and available in all grades and perfect for top quality furniture manufacture, top grade oak floors, window manufacture, carpenters and joiners. Best of all our oak boards are sold at competitive prices. Give us a call today for a quote. We are here to help.